Since kids began hearing the tale of how their gifts end up under the tree on Christmas morning, they've been told about a jolly fat man with a big white beard flying through the night in a flying sleigh powered by a team of eight magical reindeer. Yes, it's been a great ride for this story, but it has come time for Santa to upgrade from that worn out old truck of a sleigh he has used for generations. As Airplanista does each Christmas season, we've again sent our writer to go undercover up at the North Pole to get the real scoop on what Santa and those Elves are doing. In the past, we've reported on morale issues in the workshops, with disgruntled Elves threatening work stoppages if they had to work more unpaid overtime. We've also reported that while Santa's current flying sleigh is rather dated, it is also screaming fast, and despite a full steam gauge panel, is still capable of making instrument approaches to every rooftop in the world in one night...in full IMC. Behind a series of locked doors accessed only through retina scans and a DNA sample is the North Pole's secret development lab. With white floors and a sterile environment, you might think this is where silicon chips are being invented. But at the center of this "clean room" sits the Sleighmaster 3000ti, the uber-secret new sleigh Santa hopes to unveil in a couple of weeks. It is longer, taller and much more sleek that the old sleigh we've seen on Christmas cards of yesteryear, and through "clean sheet" design, the 3000ti introduces the latest in aerodynamics, reducing drag coefficients to unheard of levels. But the real jaw-dropper is the choice of power. Gone are the reindeer, replaced by Santa's own brand of turbofan engines, mounted in a "UTGCHEM" configuration, for "under the gift cargo hold engine mount" system. Santa's new XMB7000R-2 engines are three-shaft high bypass ratio turbofan engines, each with a dry weight of 19,345 pounds. Each has eight-stage compressors, a 12-stage HP compressor, and double annular combustors with 48 fuel injectors per engine. Maximum thrust on each engine is 93,400 pounds at max takeoff weights. From this post last holiday season on Airplanista, we know Santa has to get it on in order to hit every house in the world in one night. And while many #Avgeeks did team up to "pimp" Santa's old sleigh last year, it was not enough, as a couple of neighborhoods in Ottumwa, Iowa had to be missed to stay on schedule. Santa - being a stickler for perfection - came back to the North Pole fuming, and after taking one day off to log his flight, he began putting together the team to design and build the Sleighmaster 3000ti. 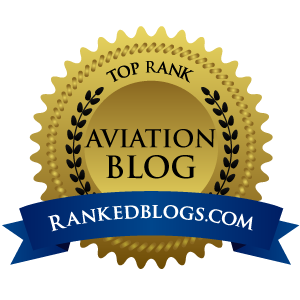 Daunting and expensive, the FAA certification process is thought by many in the aviation world to be the primary hindrance towards substantial GA growth. New airplanes get stuck in certification hell, and manufacturers blow through millions in venture capital before getting anywhere close to a type certificate. With the Sleighmaster 3000ti, the story is the same...cumbersome regulations causing unnecessary delays. As the hard deadline of a Christmas Eve flight approaches, tension is palpable at the North Pole because the old sleigh is out of annual and parts are no longer available. 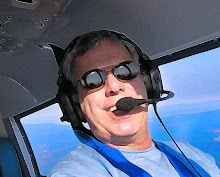 Right now, the 3000ti has flight tested perfectly, and is waiting for that TC to arrive from Oklahoma City. But Airplanista has learned that there are two issues that could very well harpoon the entire process, grounding the Sleighmaster indefinitely, and putting the entire Christmas gift delivery flight in doubt. First are issues with the cargo hold, which must be built to carry the estimated 8.25 MILLION tons of gifts needed to deliver to boys and girls around the world. FAA inspectors recently discovered that the structure under the gift hold - which is part of the "UTGCHEM" design - could only hold 70,957 gifts per square inch, about 5,560 short of the minimum capability for transportation of gifts as outlined in FAR Part 1669-A, subpart 5, section 3, paragraphs 1 and 2. Engineers have been trying to find a workaround to satisfy FAA, but so far, the North Pole FSDO refuses to issue the field approval to allow the planned December 24th departure. But while the structural deficiencies may well end up being remedied, the bigger issue is those mega-jet engines, in particular, the noise levels that they emit. FAR Part 1669-A, subpart 2, section 4, chapter 1, rule 56b was written back when sleighs were powered by magic reindeer - and the FAA has been quiet about possible rulemaking to update the regulation - so anything over the sound of a reindeer fart has always been unacceptable. 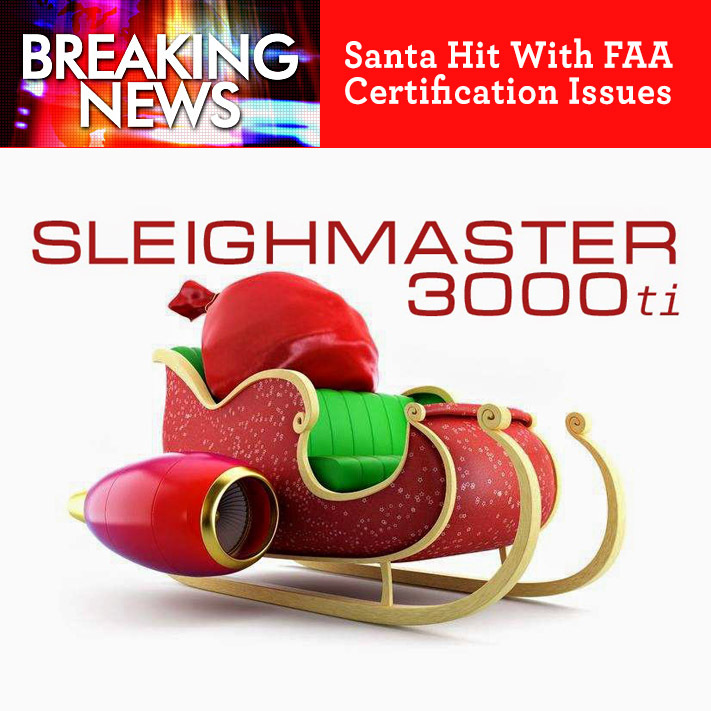 FAA noise regs for sleighs say maximum decibel levels must not exceed 0.23 dB on takeoff, but the new XMB7000R-2s on the Sleighmaster 3000ti produce 156 dBs, so they are now out-of-service until a fix can be designed. "We've tried everything," said Lead design Elf Wrench B. Turnin, "including a deflector on the back of each engine to fool the Feds into thinking the new engines are quiet enough to allow Christmas to take place. I mean, really...zero point two three dB? Are they f-ing KIDDING? I can burp louder than that! But they are on to us...so keep this on the QT...we're going to try sticking 5,789,142 bags of marshmallows into each engine in hopes it will muffle the sound just enough to get these FSDO goons off our six. By the time we blast off outta here and reach Anchorage, we'll be spittin' roasted marshmallows out the back of these big honking puppies we have for engines. And, with a little chocolate and a few tons of Graham Crackers, we'll be layin' down a layer of S'Mores all across the frozen tundra that the FAA can chew on!" As the important Christmas flight approaches, Santa assures Airplanista that he has the FAA inspectors just where he wants them, and he's confident he'll get the sleigh's TC in time to launch on his gift run. "Those inspectors have kids, know what I'm sayin?" said Santa, winking. "Would be a damn shame if those children woke up to see no gifts under the tree this year because their parents couldn't, you know, work wit' me on this." This is a developing story, and Airplanista has boots on the ground at the North Pole ready to report any news as it happens. Stay tuned to this blog for updates, in real-time, thanks to the dedication of our embedded aviation journos on the scene and an awesome wi-fi connection at the hotel where we have set up base camp.